Download Aphesis See below for help. Please be aware: Planetdance has a much more comprehensive version of aphesis. 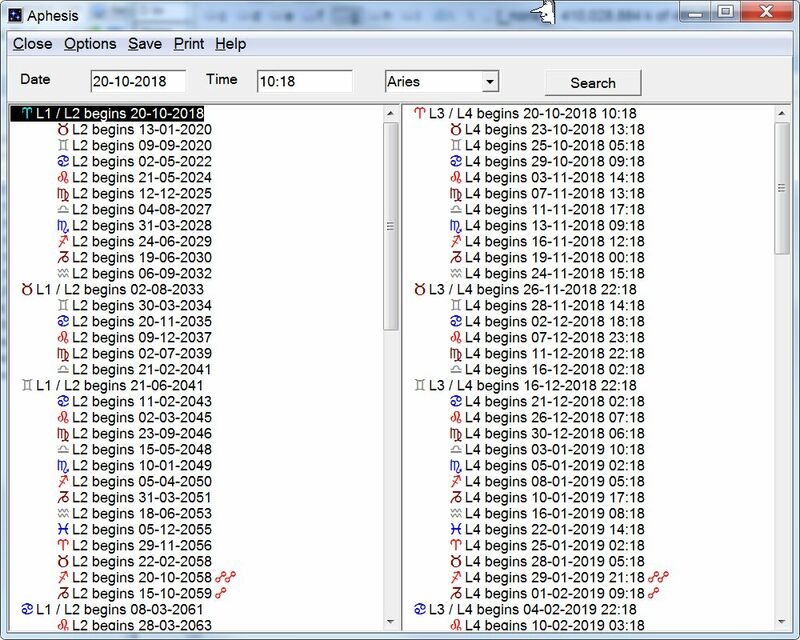 � When entering date or time you can separate the numbers with any token, 1-1-1999 works as well as 1 1 9999. � Use Options to change language, date-format, font size, the number of main periods. � If you check Options Text only the symbols are replaced with text. � Click anywhere in the left box to see the sub levels of the method (in the right box). � A Loosing of the Bond (see below) is displayed with the double opposition symbol after the date. The symbols of the images after a Loosing of the Bond are also marked by an opposition symbol. The term Zodiacal Releasing stems from Hellenistic astrology and was coined by Robert Schmidt (project Hindsight). The method is found in Vettius Valens, Book 4 of his anthology (2nd century AD.). Robert Schmidt in 2007 published an audio tutorial on the method entitled: Zodiacal Releasing from Spirit: Charting Career with Hellenistic Astrology. It is highly recommended to purchase and study this tutorial, as it was groundbreaking in making this material accessible to a modern astrological audience. Martien Hermes (his real name, not an alias J) published a Dutch book on the method: "Good Times, Bad times. Prognosis with zodiacal aphesis of the Part of the Daimōn. Modern careers and biographies studied with Hellenistic astrology." At the moment, Martien is working on a new edition of the book. Martien has adopted Robert Schmidt�s terminology for this help file. Zodiacal releasing is the method of moving through the images of the zodiac in succession from a certain starting point. Each image distributes a specific period of time. This starting point is determined by either the part of Fortune, or the part of Spirit, i.e. the lot of the Daimōn. In Hellenistic astrology each of the seven classical planets, had its own �Lot�, their �part�. There is a lot/part of Ares/Mars, Aphrodite/Venus, Zeus/Jupiter, and so on. Two of those parts were very important in Hellenistic astrology, that of Selene/the Moon known as the part of Fortune, and that of Helios/the Sun known as the part of the Daimōn. None of the Hellenistic periodic systems had a separate name. The general term for all these techniques is �profection� which means progression, move/moving on, going further. It thus refers to the way in which time periods progress and with what measure of time. The full term for this technique as used by Robert Schmidt is: �Zodiacal releasing from Spirit�. All zodiacal images (signs) were allotted a time frame during which their dispositor rules as the Chronocrator of the period. The enclosed table shows the minor or short periods of each planet. They can be used for both years as well as so many months. They play a major role in many of the forecasting techniques used by the Hellenistic astrologers also for this method: aphesis. The (small) periods are all based on astronomical cycles of planets. Planetdance calculates two life scenarios; one starting from the image Fortuna is in, and one starting from the image the part of the Daimōn resides. The calculation starts in the sign in which the Daimōn is located at birth (or Fortuna if one chooses that image). That image starts the first period of life and measures out its years. The period distributed is the minor period of the dispositor of said image (see the table). After the major first period ends, the next image (after the one where Daimōn or Fortune is) and its dispositor take over the second period, and distributes its own years. And so on. The native�s life generally has four to six major periods, depending on which image starts the series. Zodiacal releasing divides fairly lengthy major periods. Level 2 distributions divide each major period into smaller periods. The minor-periods have the same succession of images as the main periods, but now the planets distribute their period in months, instead of years. So the first minor period under any major one, falls under the same image, but now divides its months. Mind you, these are months of 30 days each. The Hellenes counted a year by 360 days, and had months of 30 days. The dates can vary when making use of a year of 365 days. As one can see in the table, Valens differs in the allocation of years and months for The Water Pourer and the Goat Horned One. He gave the Goat Horned One 27 years (or months), and the Water Pourer 30 years (or months). This difference in allocation of years and months has to do with the long period of the planets. For further study, refer to Schmidt�s tutorial, and Valens book 4, p. 10 (Schmidt�s translation). The images and planets can distribute even smaller increments of time. These are shown in the right hand box. Click anywhere in the left box to see the sub levels of the method in the right box. If one distributes the periods per month for level two (L2), it will be found that, with certain images, the months run out before the major period (L1) is over. The months of the 7 classical planets add up to 211 months. That's a total of 17 years and seven months. In the periods of the Twins, the Crab, the Lion, the Virgin, the Goat Horned One (Capricorn) or the Water Pourer, there are not enough months to fill the major period with minor periods because these images distribute periods that are longer than 17 years and 7 months. In such cases according to Valens we need to switch to the other side of the zodiac, and resume distributing periods from the image opposite the one that started the major period. The technical term for this is �loosing of the Bond�, which in literal translation is something like �breaking the obligation�. The obligation referred to is going around in a fixed order through the zodiac, following the circle in the succession of the zodiacal images. That succession is interrupted, it switches to the opposite image. Schmidt cites four significant phenomena in aphesis and Martien Hermes found two more. These are �turning points in the life scenario� because they all in some way designate a special event in the major period. They all have to do with arriving in a specific minor period that is related in some special way to the image signifying the major period. They have this special effect at all levels of zodiacal releasing, i.e. in all periods of time, up to and including the smallest ones. However, their effect in main periods can be weightier than in the underlying levels. This list of turning points can be found in each new major period, and any minor period. So you may experience several of these turning points during one specific main period, but also several times in the course of your life during each major period as your life progresses. 1. The times arrive in the image where the Lord of the Daimōn resides: "Finding the/a/your life's work, perhaps even a vocation" (Schmidt: finding one's life's work)." 2. The times arrive in the image where the domicilelord of the main period is located. So when the Ram distributes the major period, these are the times when we arrive at the image where Arēs/Mars resides. "A typical and/or period defining event (Schmidt: Defining event)"
3. The times arrive in the other image of the planet that rules the major period. So when the Ram distributes the major period, these are the times when we arrive at the Scorpion, the other image of Arēs/Mars. "A watershed/break/focus period (Schmidt: Turning Point)." 4. The opposite image of the one distributing the major period takes over (explained above). "A turn and/or disrupted trend (Loosing of the bond)." (Schmidt: it changes the dynamic of the rest of the major period). 5. The times arrive in an image of a planet located in the image that distributes the major period. So when the Ram distributes the major period, and Aphroditē/Venus resides in the Ram, these are the times when we arrive at the Bull or the Scales, the images belonging to Aphroditē/Venus. "Period Typical motivation/event." 6. The times arrive at the image in which a malefic is situated that is diametrical to (opposes) the domicile ruler of the major period, or is tetragonal (square) to it, or is diametrical to the image that rules the major period. "A possible split in the period"
Mark these times when you study these periods. Things happen in these times!